The Apollo 17 Lunar Module Challenger descent stage comes into focus from the new lower 50-km mapping orbit, image width is 102 meters [NASA/GSFC/Arizona State University]. LRO maneuvered into its 50-km mapping orbit on September 15. The next pass over the Apollo 17 landing site resulted in images with more than two times better resolution than previously acquired. At the time of this recent overflight the Sun was high in the sky (28° incidence angle) helping to bring out subtle differences in surface brightness. The descent stage of the lunar module Challenger is now clearly visible, at 50-cm per pixel (angular resolution) the descent stage deck is eight pixels across (four meters), and the legs are also now distinguishable. The descent stage served as the launch pad for the ascent stage as it blasted off for a rendezvous with the command module America on 14 December 1972. Apollo 17 descent stage imaged shortly after the ascent stage lifted off marking the end of humankind's first era of lunar surface exploration. View is towards the west [NASA Photo]. Tracks are clearly visible and can be followed to the east, where astronauts Jack Schmitt and Gene Cernan set up the Surface Electrical Properties (SEP) experiment. 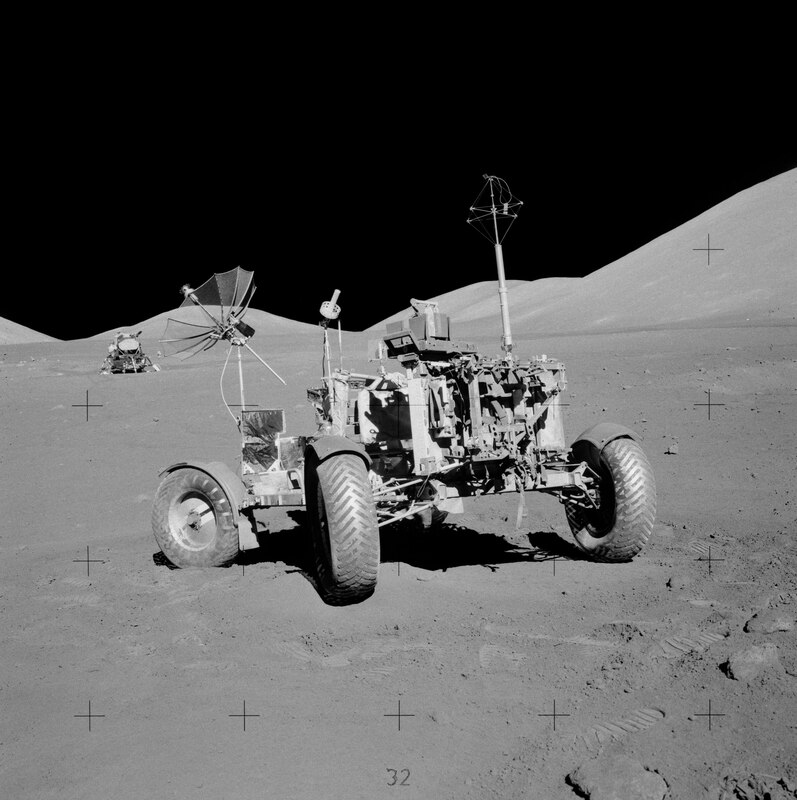 Cernan drove the Lunar Roving Vehicle (LRV) in an intersecting north-south and east-west course to mark positions for laying out the SEP thirty-five meter antennas (circle labeled "SEP" marks the area of the SEP transmitter). The dark area just below the SEP experiment is where the astronauts left the rover, in a prime spot for monitoring the liftoff. The SEP allowed scientists to characterize the electrical properties of the regolith, which are important for interpreting remote sensing measurements of the Moon such as radar and microwave sounders. One interesting direct result of the experiment was the discovery that the soil is extremely dry, with no water hiding below the surface! Region of Taurus-Littrow valley around the Apollo 17 landing site [NASA/GSFC/Arizona State University]. The two explorers were quite busy, as they also deployed a set of sophisticated surface science experiments that radioed data back to the Earth for more than four years after the mission was completed. The Apollo Lunar Surface Experiments (ALSEP) package was a little different for each Apollo mission. The Apollo 17 ALSEP included: 1) Lunar Seismic Profiling Experiment (geophones), 2) Lunar Atmospheric Composition Experiment (LACE) to measure the composition of the Moon's extremely tenuous surface bound exosphere, 3) Lunar Ejecta and Meteorites (LEAM) experiment, 4) central station, 5) Heat Flow Experiment, 6) all powered by a Radioisotope Thermoelectric Generator (RTG). More details on the ALSEP and their results can be found in the Apollo Lunar Surface Journal and the Apollo 17 Preliminary Science Report. Four times enlargement of area around the Apollo 17 ALSEP [NASA/GSFC/Arizona State University]. The central station was the heart and brain of the ALSEP. It distributed power to all the experiments from the RTG, received commands from the Earth, and transmitted data back to the Earth. In both surface images (below) it is easy to spot the axial-helical antenna (a nearly vertical white rod) on top of the station pointed towards Earth. The RTG supplied 70-watts of power by converting heat from the decay of plutonium-238. Try and find all the pieces of the ALSEP in the LROC image enlargement (above). The two annotated surface images (below) will help you orient yourself - as though you were there working alongside Dr. Schmitt and Captain Cernan. View of the ALSEP looking south-southeast with geophone rock in the background: two other large rocks are keyed to the LROC image (R1 and R2) [NASA Photo]. The background in both surface pictures gives a feel for the rugged terrain that surrounded the astronauts as they explored the valley. The mountains rise 1.5-2 kilometers above the valley floor, which is more relief than you would find at the Grand Canyon in Arizona (USA). The Challenger descent stage was extensively documented prior to launch and samples of the materials used to make the stage have been preserved at JSC. When human explorers return to Taurus-Littrow, the Challenger will provide vital information about the long-term survival of materials in the lunar environment. ALSEP components with the Lunar Module Challenger in the background [NASA Photo]. Browse the full resolution NAC frame and watch the Youtube video! Posted by Mark Robinson on October 28, 2009 11:52 UTC.